The first robot and networked tablets are making their way today to an Ebola treatment unit in Liberia, where they will give aid workers their first chance at sharing data about the deadly outbreak. 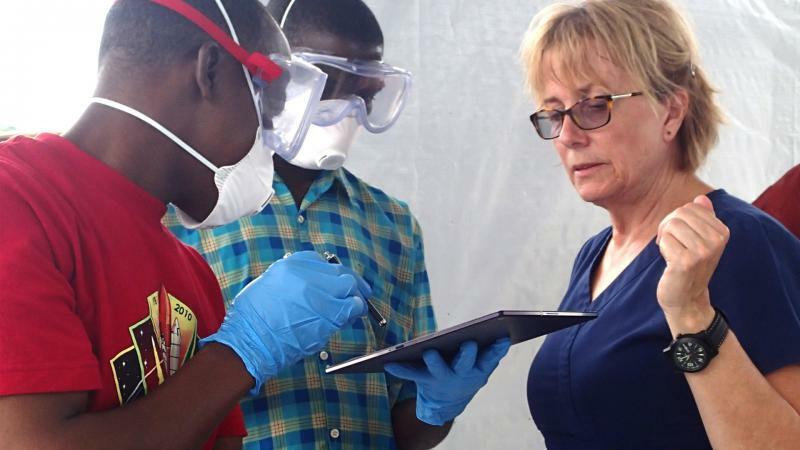 Debbie Theobald, co-founder and executive director of Cambridge, Mass.-based Vecna Cares left on a flight to Monrovia, Liberia Tuesday night, taking the company's own CliniPak tablets, a robot and the technology needed to set up a local area wireless network. For doctors and nurses accustomed to scribbling patient notes on pieces of paper in any of the Ebola Treatment Units (ETU) scattered across West Africa, this will be the first time they'll have access to portable computers that can share information wirelessly. It also gives them an electronic medical record system to track patients and share treatment and disease information with clinicians in other units and researchers in various countries. This also marks the first time a robot will be working in one of the treatment centers. "I think that this system is critical to fighting the outbreak," Theobald told Computerworld. "This is the first time they'll be using digital records at all in any of the ETUs. Everyone has been using paper. If they have had a tablet, all the information they're capturing is stuck on that tablet because they haven't been able to data share across tablets." Theobald, who worked with VGo, a Nashua, N.H.-based robotic telepresence company, is focused on having the electronic medical record system -- it includes the wireless network, the tablets and a VGo telepresence robot -- up and functioning by Tuesday, when a new Ebola clinic is set to open in Monrovia. Vecna Cares, a healthcare IT company, will also be bringing the medical records system, minus the robot, to ETUs in Lunsar and Makeni, both towns in Sierra Leone. Depending on how well the VGo robot functions and is accepted in Monrovia, others could be sent to Sierra Leone to aid outbreak efforts there. Theobald, who will be staying in Liberia to initially run the robot and train others to operate it, said the robot, for now, is being used as a training assistant. The telepresence robot, which has audio, a camera and a screen showing a remote user's face, will enable the trainer, who can safely stay out of the infectious area, to help a doctor or nurse who might have questions about using the tablets or the Wi-Fi network while treating patients. "To support the doctors capturing the data, we're bringing the robot," she said. "Clinicians working in the unit are wearing hazmat suits and three layers of gloves.... The doctors are coming to a new place and now they're trying to collect data with something they haven't used before. That's a difficult hump to get over. They need to worry about their patients and the treatments they're giving them and not the technology. We'll be right there beside them with the robot." However, Theobald said she suspects that once the aid workers see how much help a telepresence robot can offer in a clinical situation, they'll want to use VGo as more than just a training assistant. The robot, for instance, could allow nurses and doctors outside of the quarantined area to communicate with patients and clinicians inside. It also would enable them to observe patients and how they respond to treatments. "I think when we get over there and people see the opportunity of the system, I am going to get very little time on that robot," she said. "We'll see how much I get to drive it after that first week. I'm sure there will be lots of people who want to get in there and talk with patients." For now, though, Vecna Cares is focused on creating more usable medical records. "Currently, in every ETU, they use paper," said Theobald. "When a patient is triaged and moved to an isolation area, their paper records stay with them. If the patient is isolated, so is their paperwork. The doctors try to remember information about the patient and then rush out and write it down. And they're doing that in [quarantined] patient wards that could hold anywhere from 20 to 100 beds." While that makes it difficult to track the status of each patient, it also makes it nearly impossible to get the information needed to study the outbreak. "It's about daily care but it's also about learning," added Theobald. "People are talking with each other so as we collect more data, we're able to share that information across other treatment centers so we can improve clinical regimens and change outcomes for more people." She also noted that the electronic records system should help researchers. Right now, when a sample, such as blood, reaches a laboratory with the National Institute of Allergy and Infectious Disease to be studied, it might arrive with a torn piece of cardboard that simply notes whether the patient was male or female and when the patient died. With shareable electronic medical records, researchers should be able to find out how long a patient was sick, his or her age, where the person was from, any other illnesses involved and treatments received. "Doing this kind of data sharing and filtering, and doing data drill downs, it just wouldn't have been possible with the data system they're using now," Theobald said. Brent Terry, a vice president with VGo, said the company's eager to find out how well the telepresence robot works in Liberia. "Depending on what they learn, we may need to make some changes," he said. "There's tremendous heat and moisture there at this time of year.... It's basically in a steam bath and that could be an issue for the electronics. We may need to do some special work to bulletproof the processors to protect them from potential damage." This effort to bring technology to the fight against the Ebola outbreak comes just weeks after technologists and aid workers from around the country held a multi-location workshop. The workshop was aimed at helping roboticists discover what kind of technology is needed now to help healthcare workers in West Africa as well as what needs to be developed in the future.